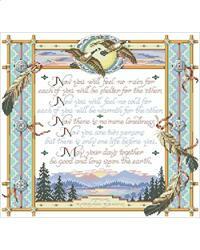 This wedding blessing offers the plainly spoken, yet provocative, caring insight of life together. Wise in the ways of life, love and heritage, this blessing will certainly be admired by newlyweds. The text reads" Now you will feel no rain for each of you will be shelter for the other. Now you will feel no cold for each of you will be warmth for the other. Now there is no more loneliness. Now you are two persons but there is only one life before you. May your days together be good and long upon the earth." Project Size: 14w x 13h"